Spring is almost at hand. Are you ready to green your home? 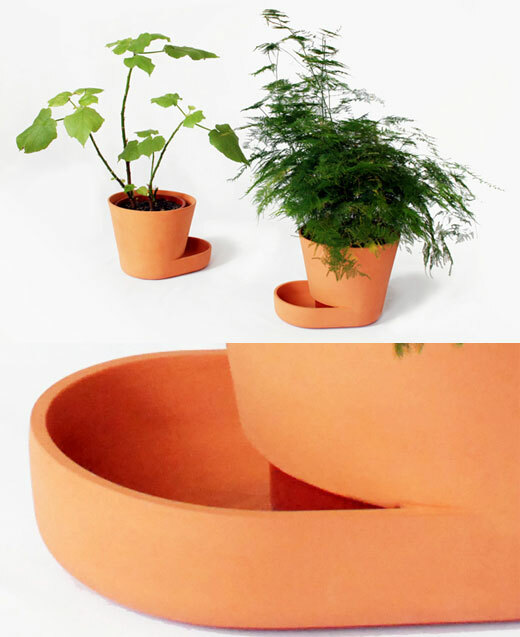 Thought you might want to update your plant pot, we prepared today’s post – 17 Creative and Innovative Plant Pot Designs which will help to stylize your indoor/outdoor gardening as well as keep your plant alive and healthy. 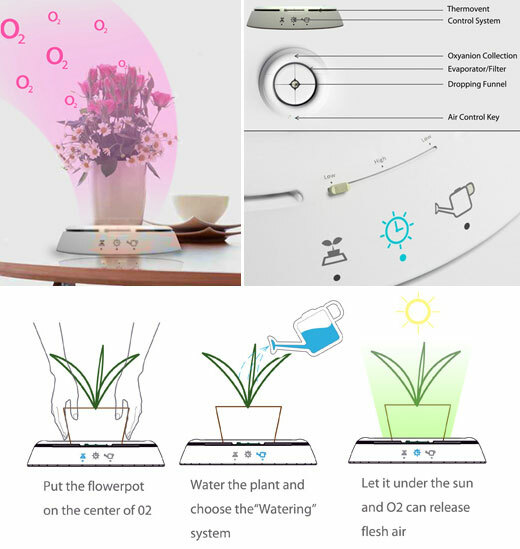 Basing on their features, we categorized them into four group: Pot with Multifunction; Pot help you communicate with your plant; Pot help water your plant and Pot with Unique Shape. This is a planter and a fishtank. You put your regularly potted plant in this pot on top, and a goldfish on the bottom. What could they provide for eachother, you might ask? Waste! Yes, the fishes turn their eaten bait remnants into nutrients for the plant, while the water fed to the plant is filtered as it passes though and becomes clean for the fish. It is a totally natural and lovely system. Place your potted plant on the O2 and water as usual. Excess water is evaporated and the system accelerates the process of photosynthesis, not to mention keeps tabs on our green friends so you’ll always know when they need water. Timeless Garden tries to bring in a green patch and clock to match your décor. Using the chemistry between mud and metal, the clock sustains itself, without craving additional toxic juices. 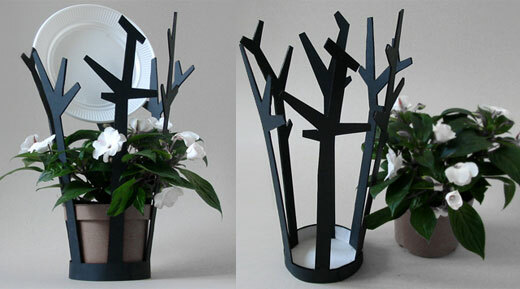 The frame is a hitch between by two recycled plastic bodies fashioned as a pot/clock. hmmm…I’m just wondering what will be the outcome if I happen to over-water the plant. 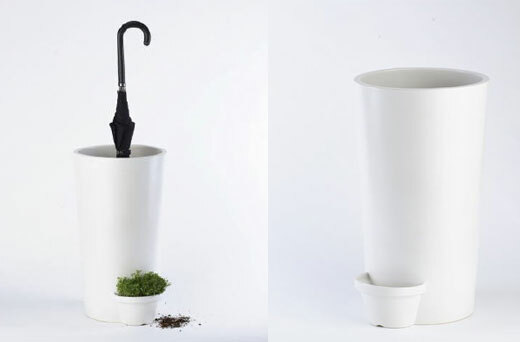 The umbrella pot made of ceramic has a small plant pot at the bottom to use the rain water. 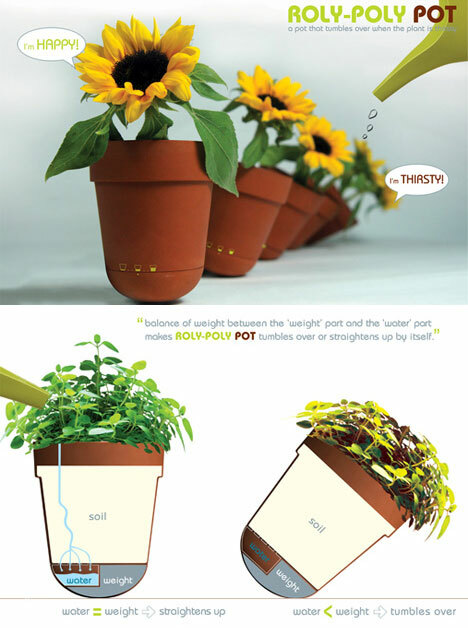 This umbrella pot allows rainwater from your umbrella to drain into the plant pot. 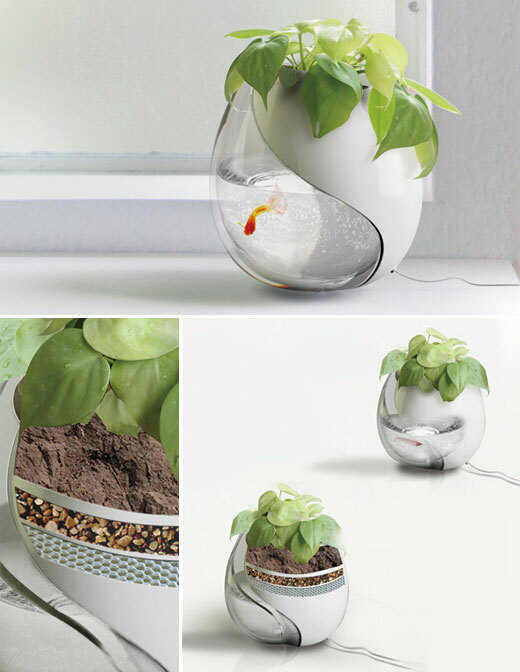 Low-maintenance way to keep a small plant. 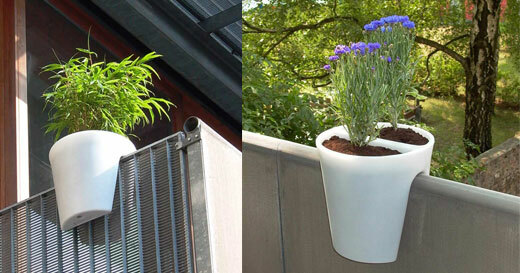 Rainwater drains into the plant pot via internal holes. Ok. This one is even werid than the umbrella above. Put my clean dish on the plant…I’m still concerned it will end up dirtying my dishes and make me wash it again. 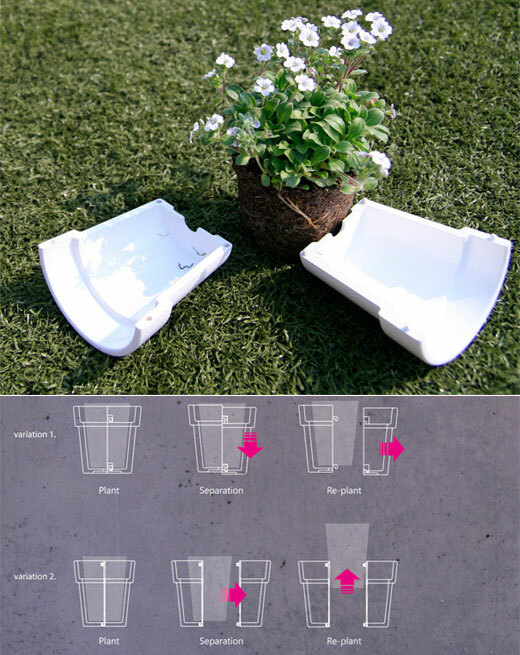 Budak is a dish drainer that enables a small plant to be watered by the water that drains off the dishes. Product can hold dishes and utensils up to 2 users. With the help of the branches around the pot, dish drainer grabs the dishes. If you or your friends are smokers, then you know how difficult it can be to incorporate an ashtray into your decor, let alone deal with the smell. Tab A (vase) and Tab B (planter) are clever little solutions to this problem, hiding an ashtray beneath either a vase or a planter. A perfect way to conceal a dirty habit both visually and aromatically. Just wonder does that will hurt the plant? 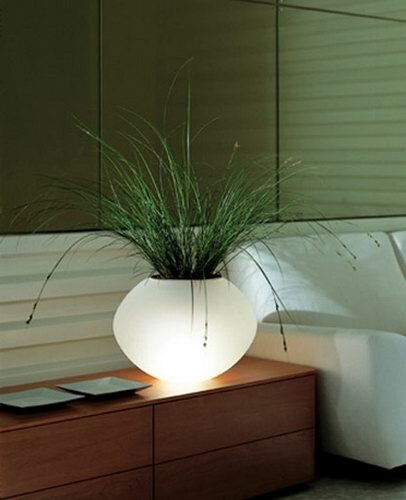 Creative table lamp design that doubles as a plant pot. It is one unlike any other I’ve seen. I hope it doesn’t get too hot or your plants might easily die or even catch fire! The thing with MonPot is that it’s a potholder with an inbuilt rotating timer and is inspired by the sorts you see on an oven. There are plants like cactus, buddleia, California poppy, red-hot poker and many herbs that don’t need watering every single day. So if you are the forgetful sorts use this alarm and do the job timely. Just rotate the base to a setting of your choice, like a day or a week and a reminder light will go off at the end of the duration. Those looking for tech-details, there is Bioplastics, solar cells, rotating base and LED involved here. 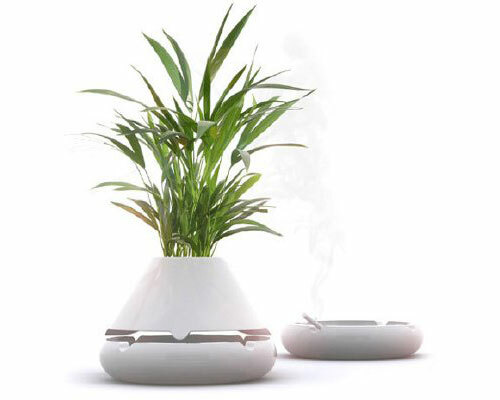 The breathing pot helps us find an analogous emotive connection with our plants. 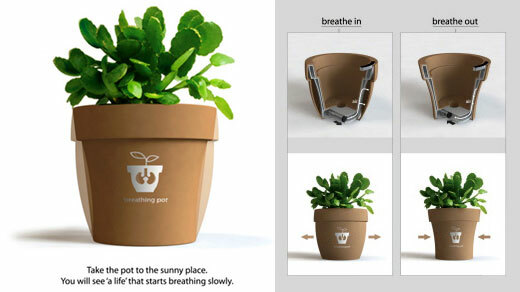 The pot expands and contracts simulating breathing. If the breathing stops, you better give that plant some water and place it in sunlight. Em, this one is a bit wricky for me… See the expression of the plant? Dissastifying? Danger? 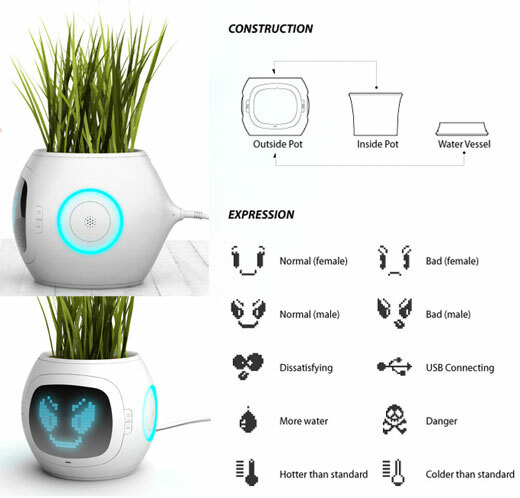 The very sleek looking pot measures soil conditions, temperature, humidity, and water – calculates those variables based on the need of said plant, and expresses its condition via a series of pictograms on an LCD display. 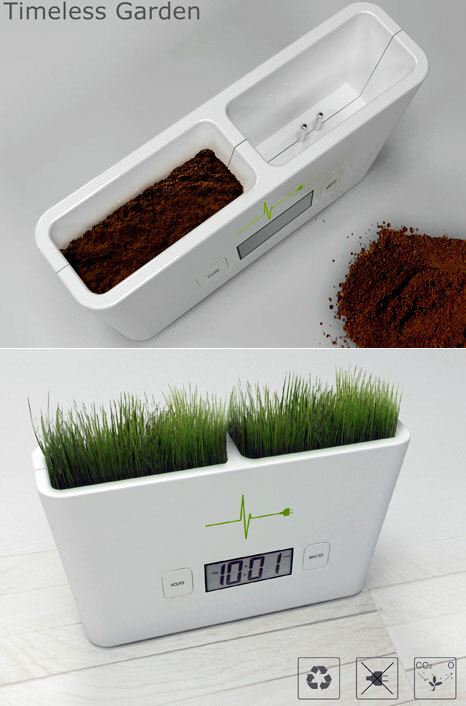 It’s also smart enough to know if you’ve over watered and will systematically drain itself into a water vessel. All this high tech goodness does mean it needs power but a simple USB interface does double duty by charging and transmitting pertinent information to and from computer software. It’s all about humidification. Humidity? Yes. The way the egg sits in the pot there, it collects. Collects the sweat of the world through the natural processes of Mother Nature. And you don’t even have to work out to make it get fed! Come with me, fellow designers, and crack this egg on your mind grapes so we can make jelly. Just like people, plants fall over when they begin to die from thirst but unlike people, plants can’t verbally communicate when they need watering. That’s where the Roly-Poly Pot comes in. Using water a a counterweight, the pot slowly tips over when water levels are low. 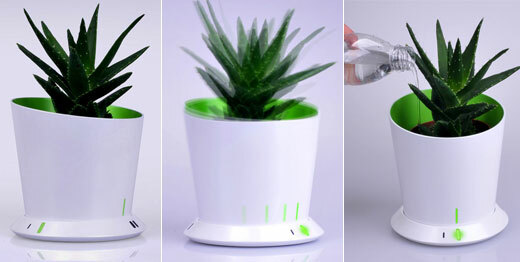 The cool thing is each pot can be adjusted to work with any plant’s watering needs. Neat idea but still a concept for now. 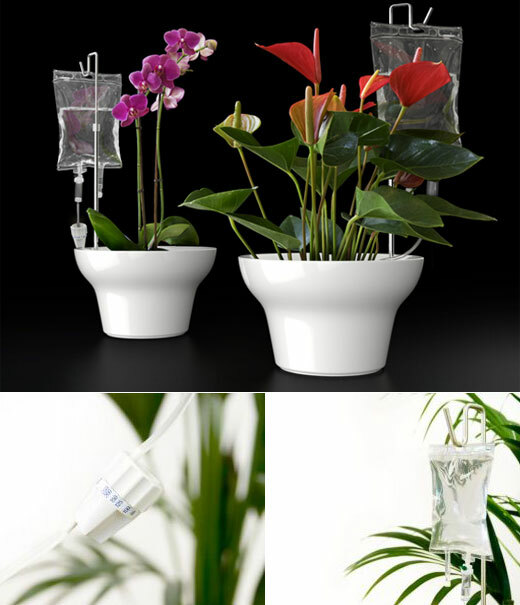 The IV Plant Pot(GBP 160, about $320) self-watering plant pot’s main feature is a medical drip feed. This unique characteristic allows the plant to be nourished with water and food as it is required. It is the most basic brilliance, the most simplistic, smart design – two of hearts, two hearts that beat as one! In this case, two bits of pottery, made one. Instead of there being a pot with a hole or holes below it being held by a saucer that would hold water, it’s both of those things in one piece! Take a peek and drip a little dribble. 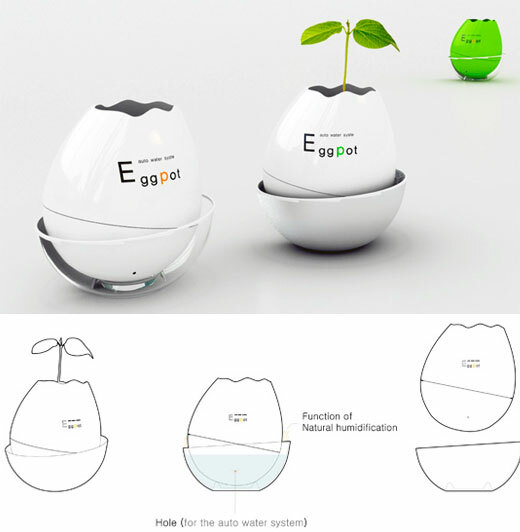 A large amount of water can be held by this new pot cuff, water that can then be absorbed at any rate the plant chooses through its roots. That’s how nature works! Very nice. Re-flowerpot looks at doing away with the heartbreak of losing a sapling due to its incorrect transfer. The pot simply breaks-up into two parts, kinda like a mold for your soil and plant. 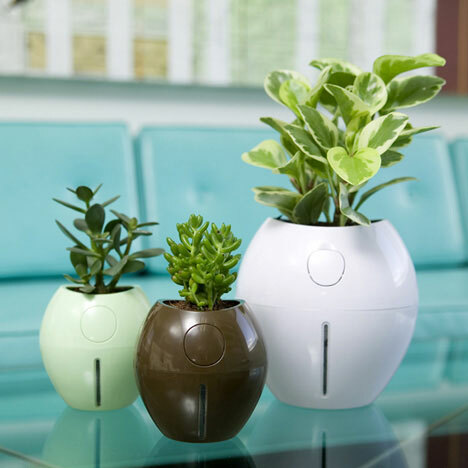 If you live in an apartment and would like to fill your balcony with some green delight, do consider this Stecklig Plug N Plant. Like those english saddles, this pot stick on top of the bannister and has 2 separate plant areas for those who like to mix and match their plants ;) Steckling is the first flower pot for balcony railing. No tools or screws are needed. What a brilliant idea eh? You can forget about using those boring green plastic box or metal hooks.